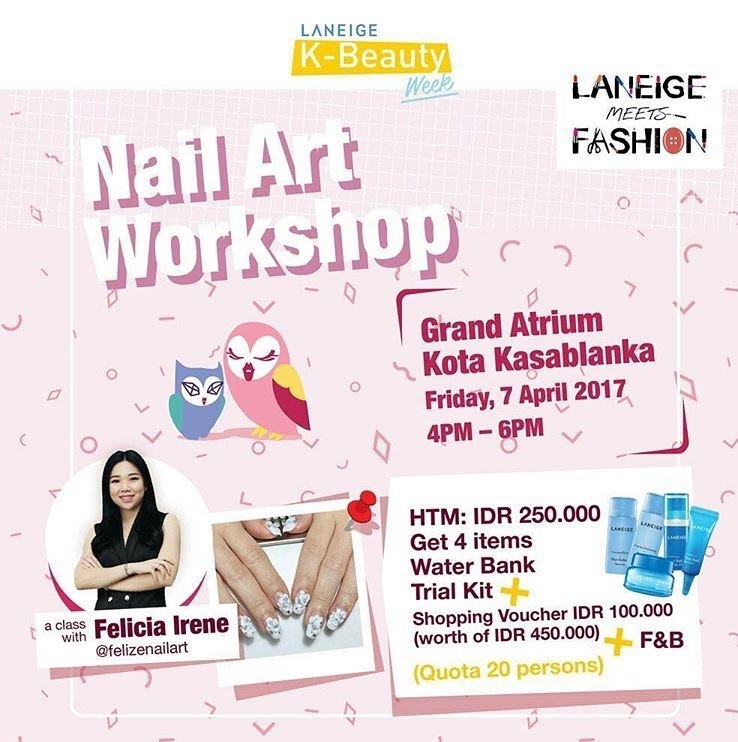 Felicia Irene will having a Nail Art Workshop at K-Beauty Week by LANEIGE. This year LANEIGE K-Beauty week titled #LANEIGEmeetsFASHION held at Grand Atrium Mall Kasablanka, 3 – 9 April 2017. There will be School of K-Beauty Class such as Flower Arrangement with kitty manu, Brush Lattering with miranti andi kasim, and Nail Art wih Felicia Irene. Our talented nail art artist, Felicia Irene will professionally teach you how to get cute-pretty nail this Friday, 7 April 2017 at 4 – 6 PM . With only 250k can join this class and get the goodie bag. For all the fashion and nail art enthusiast who wants to join the events, please register to +62 813 3741 6976 by giving your name, email address and class you want to join in.